Tuossa vasta huomasin, että Tampereen Kädentaidon messujen oppaaseen oli lipsahtanut virheellinen, vanha blogiosoite. Oikea osoite tanjaak designs blogille on tanjaakdesigns.blogspot.com . My camera broke down a few weeks ago...but WoooHoooo!!!! I finally managed to buy a new one, so maybe later I'll have something to show you guys here on my blog. Hi! 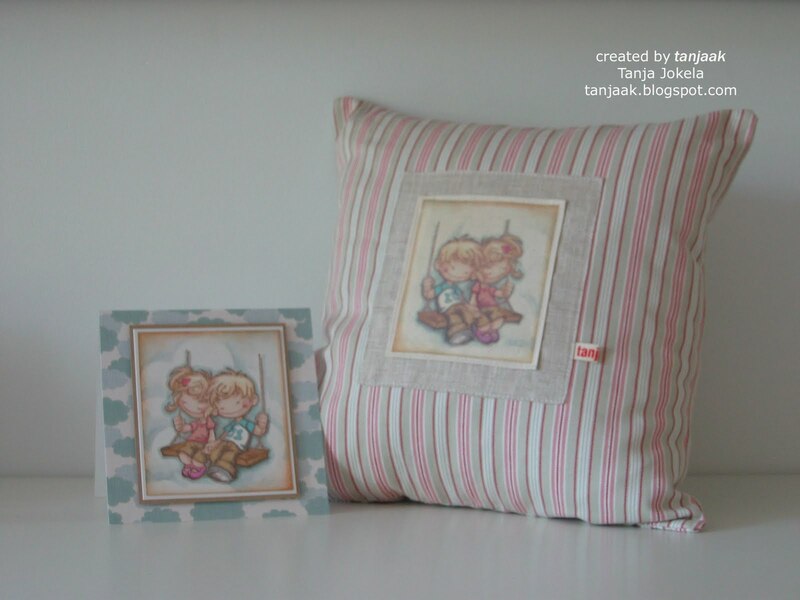 I've finally managed to make something...and take poor pictures of it LOL! So I have my new tut at the WoJ TUIN blog up now, go there to check it out. Here's Ella with her new stuff. Hello and good morning! 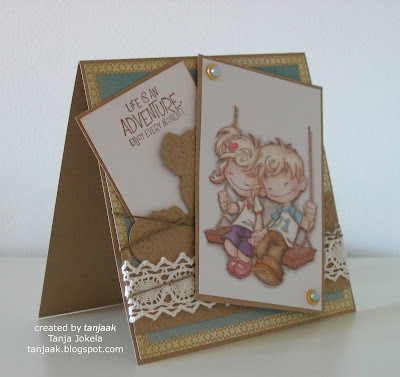 Here I am today...and guess what, this post is up the right day LOL...with my card for Stamp with Fun. This week we have a lovely theme for you. The theme is In the Garden. So I guess there will be a lot of flowery images and embellishments this week. 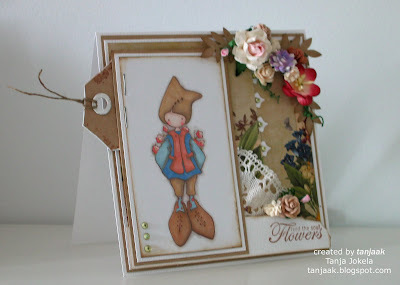 I did my card with WoJ's cute I am Sorry Gnome by Norma Fickel. I have coloured my image with Promarkers as always and have finally dug into my Webster's Pages paper pad. I just love that background dp. The tag die, border die and sentiment are all also from the WoJ store together with the image. 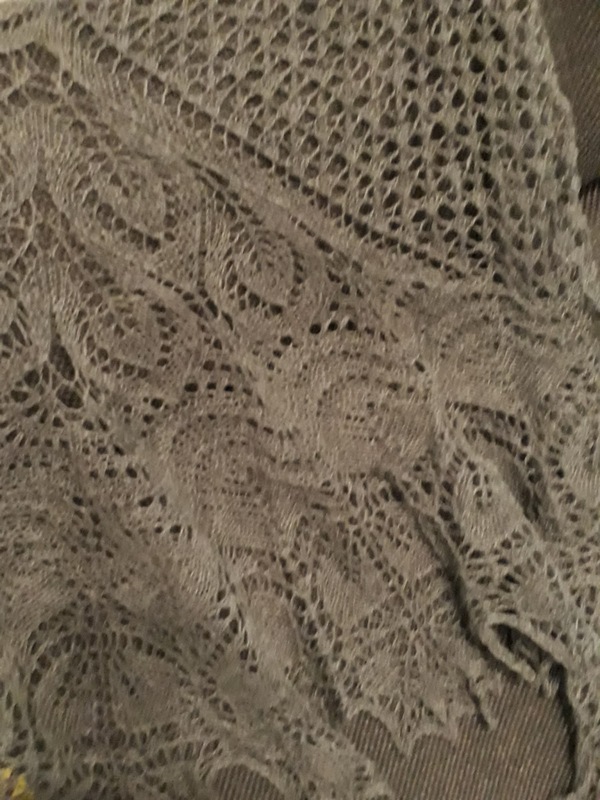 That old piece of lace is from my stash and it really is a vintage element as it is really old...believe me when I say so. 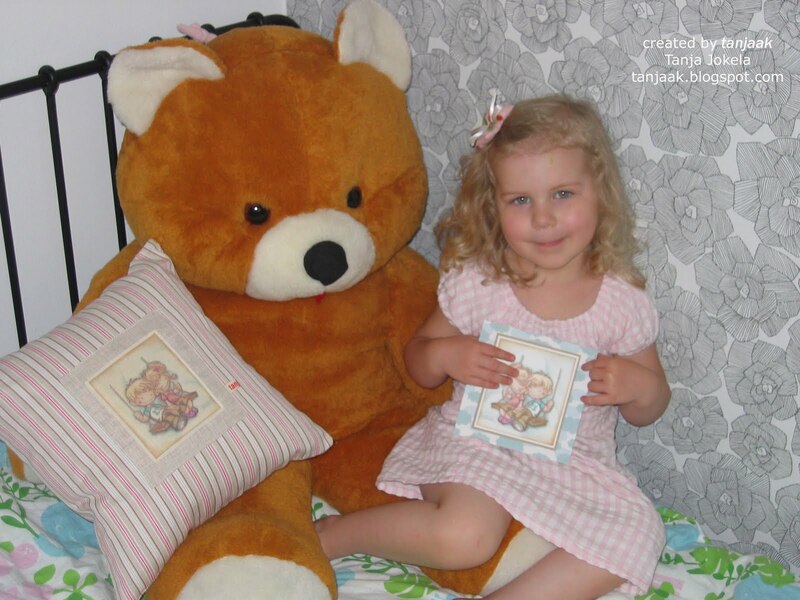 Now go on and have fun stamping and making your own garden projects! It's already tuesday and still I was without my SWF post...but hey here it is quick and sweet LOL. So this weeks challenge is to follow a great sketch again. I had so much fun making this card and I guess no one would even know if I did not tell you it here straight away that the papers are again from my scrap drawer... and some of them are even xmas papers. I also think I found my new favourite among EB stamps...this cutie is from Whiff of Joy's new stamp kit. All the kits have shipped out but don't worry if you did not preorder the kit as all the images will be released separately on the 1st of June. I did my colouring with Promarkers and added a sentiment, button twine and pearl brads to the mix. All my embellishments were from the WoJ store. Thanks for looking and have a great day you all! Oooops! I should have posted this card yesterday but completely forgot about it....there's no other excuse. But anyway there's a new challenge at Stamp with Fun with the theme of green and pink. I have used these cute swans from WoJ as my image and coloured them only slightly with my Promarkers. The papers are from MME and October Afternoon. The lace is from my stash and the button twine, brads and sentiment are all from WoJ. How great it is that you can get so much gorgeous stuff from the WoJ store. Hello all! 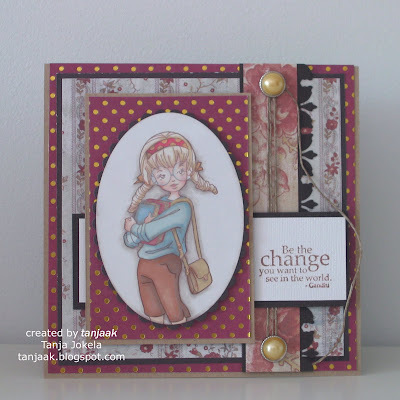 It's time to start this week withre yet another Stamp with Fun challenge. This week we have again a great sketch for you to follow. 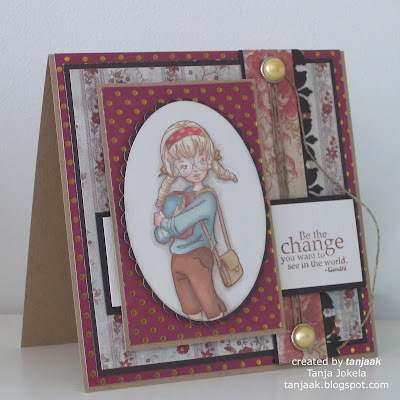 I got my dt package from WoJ and just had to play with this lovely stamp right away. It's called Friends forever - Nora and Ben. I actually spent hours colouring and cutting the image...I'm really pleased with the end result, but I guess I could have skipped the cutting part by colouring the background and the image at the same time. Those gorgeous papers are from WoJ's spring paperkit...and the lovely sentiment is also from WoJ. 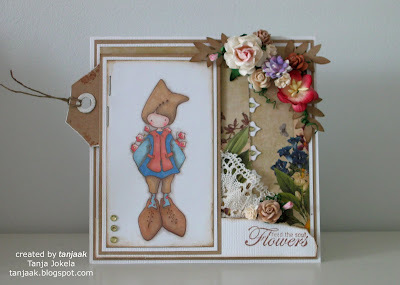 If you want to know what I was up to yesterday you should check out the WoJ TUIN blog for my latest tutorial. Hello and good evening! 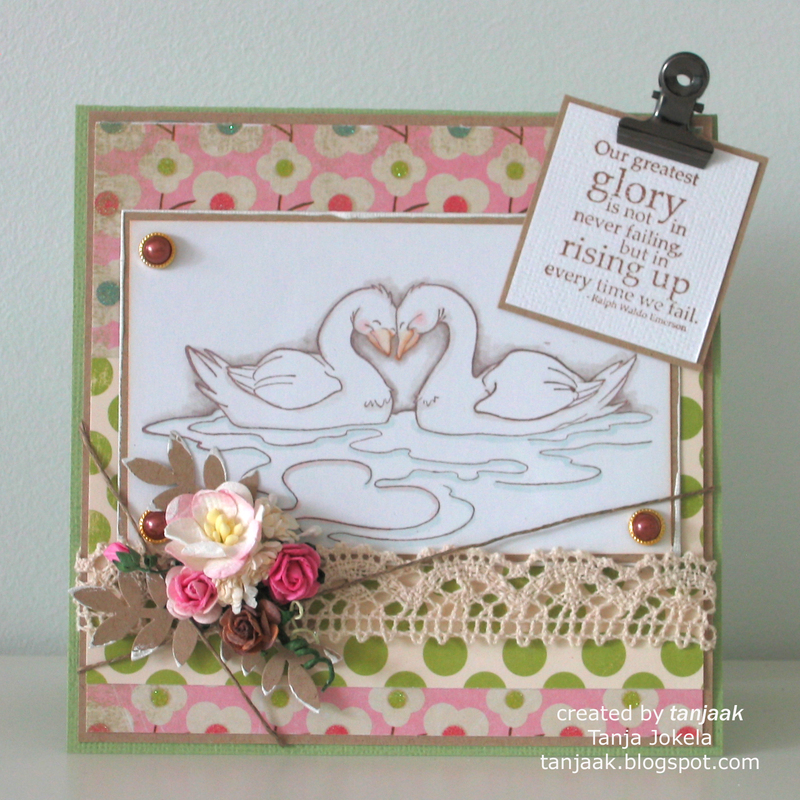 It's time to set another Stamp with Fun challenge...this week we'd like to see some ribbon or lace on your projects. 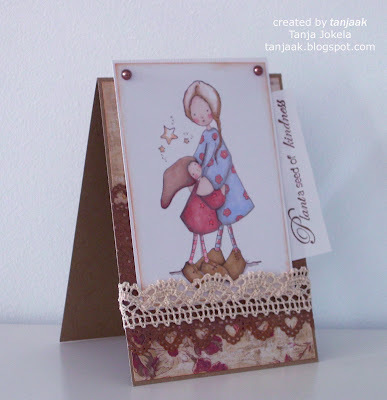 I made my card using my all time favourite WoJ stamp, Norma Fickels Mother and Child. I have coloured the image with Promarkers and paired the image with some MME and Papermania papers. The ribbon is from my stash. 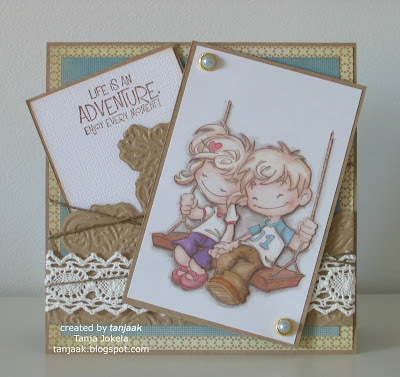 Thanks for looking and have fun stamping! ps. don't forget to go check out the WoJ store for all the new stuff there.